Gibson did come off against Fulham with a knock and there is the option Fellaini could spin back into midfield with Cahill restored to the midfield / forward pivot role. By pushing MF forward you lose some bite in midfield but you gain the advantage of being able to use his energy to press better higher up field which is especially useful against sides who play out from the back like it was with Man United/Fulham. For Stoke its probably less worthwhile given that there is less opportunity to press in these zones given that stoke kick long from the keeper and thus bypass defenders and the Belgian’s height would be better utilised further back the pitch. If Gibson is fit I’d leave out Neville and go with Felli in midfield for his aerial assistance on Crouch from kick outs and restore Cahill to the frontline. Playing a high line enables us to impact where the long balls are coming from i.e. if Stoke are allowed to get within 10 yards of our 18 yard line the cross will be potent given the quality they have in the wing berths. If we keep a line higher the opponent gets the ball further from goal and the threat of the delivery is reduced. 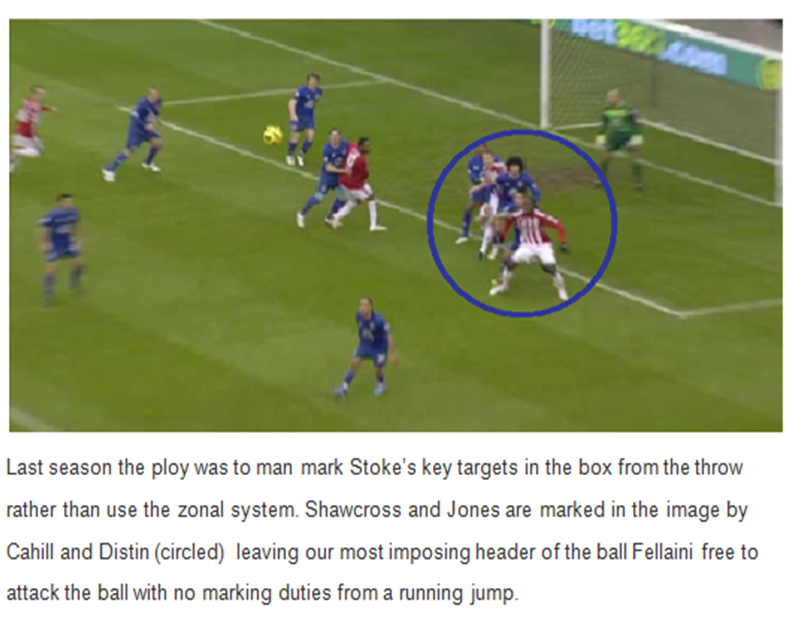 By playing higher upfield it pushes Stoke’s defence back and makes long balls to Crouch come shorter up the pitch. One aspect which will need to change from our normal game is in terms of where we press. 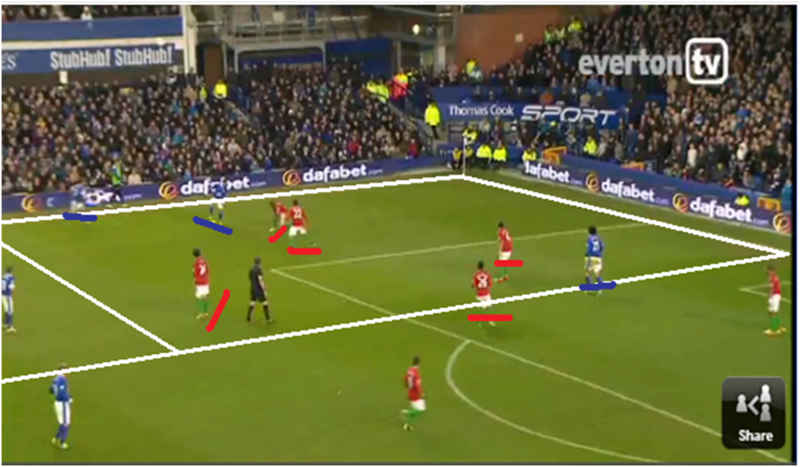 In the 4-2-3-1 we’ve been using lately we press high upfield onto opposition’s fullbacks. Against Stoke though, there is little point in pressing these areas as neither of Stoke’s fullbacks are selected for marauding runs or for their distribution skills. Begovic will pump balls up to Crouch with the defence/midfield zones bypassed so there is no opportunity to press at Stoke’s defensive line. The alternative is to drop off and keep things tight between our back four and midfield 5 and hoover up the second balls. Enter ‘The Delap-idator’. This phenomenon has waned in terms of its effectiveness but still brings back nightmares for Tim Howard and co from our first meeting at The Britannia when it caused havoc and created both Stoke goals on the day. The above image shows how we defended them last season. If Delap is selected (and I’m not too sure he will) I’d stick with this and try to turn the tables and look to use it against Stoke through quick counter-attacks as soon as we win the ball back to expose Stoke over committing players. It can be dangerous but the opposition then has to think about marking our players. It’s a given we will have more possession than our visitors on Tuesday; Stoke have posted the lowest possession (39%) and lowest pass completion (69%) per game in the top flight this season. Stoke play quite a flat midfield 4 (although Walters can sometimes drop to pick up the opposing side’s anchor man) so if we deploy 4-2-3-1 we will get some joy in between the lines and hopefully move the ball around the Stoke midfield. Good movement is always a key factor in breaking down a stubborn opponent. Stoke will set up with 2 centre backs screened by two defensive midfielders players . Fullback’s Shotton and Wilson will tuck inside close to their centre backs. To get through this defensive wall we will need to move the defenders about to create space. 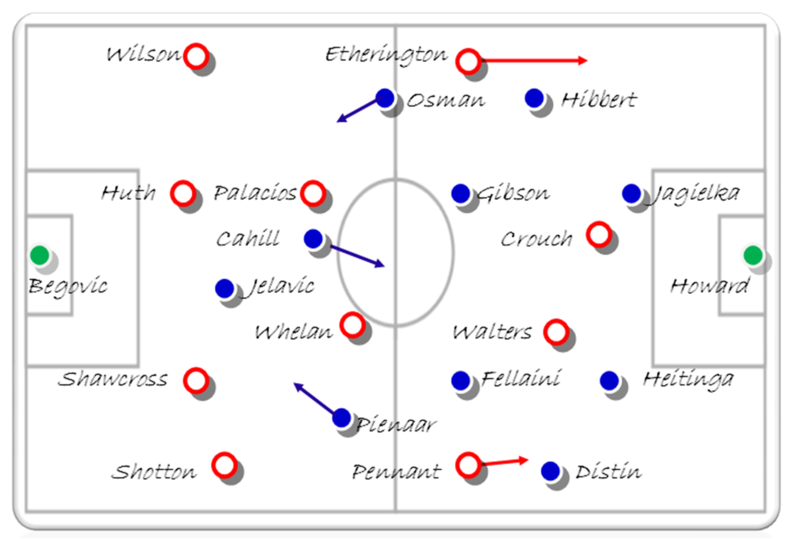 In the past we have struggled to break down organised sides who sit deep due to our poor incision/movement in the final third – for the record we’ve scored just once in our last 360 minutes against Stoke but hopefully the incision of Pienaar and the movement and goal threat of Jelavic will remedy this. Despite having 67% of possession the Blues failed to create any goalscoring opportunities meaning that Sorensen didn’t make 1 save in the entire game which we lost 0-1. The team was basically setup in a 4-4-2 with Cahill and Velios upfront. Breaking down a side as rigid as Stoke is tricky but it is achievable with good movement being key. 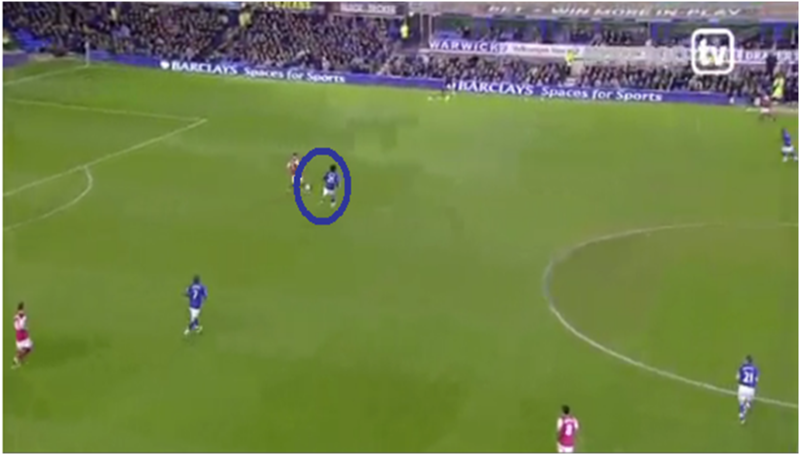 There was simply no movement from Cahill or Velios when we had possession. Both allowed themselves to be marked by their respective defenders meaning when we had the ball there was nothing happening through the middle of the pitch. Stoke are a specialist set piece side who live and breathe defending crosses. 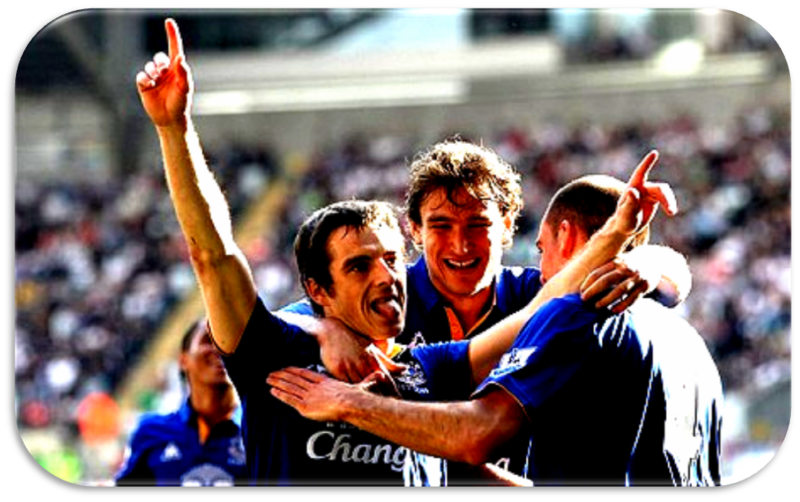 Our lack of attacking options meant that inevitably Baines was the only out ball and Stoke seemed fairly happy for him to have it, knowing that a cross would be incoming and with the heavy artillery they have in the air there was only going to be one winner. The sheer volume of numbers Stoke cram into their box , coupled with the deliberate blocking of our runners (Fellaini / Cahill especially) led to 33 of our crosses amounting to zero attempts on goal. When Stoke did cross their halfway line and we won the ball back our passing was laboured meaning that by the time we did move the ball forward on the counter, Stoke’s compliment of defenders were all back behind the ball and in position ready for our next cross. 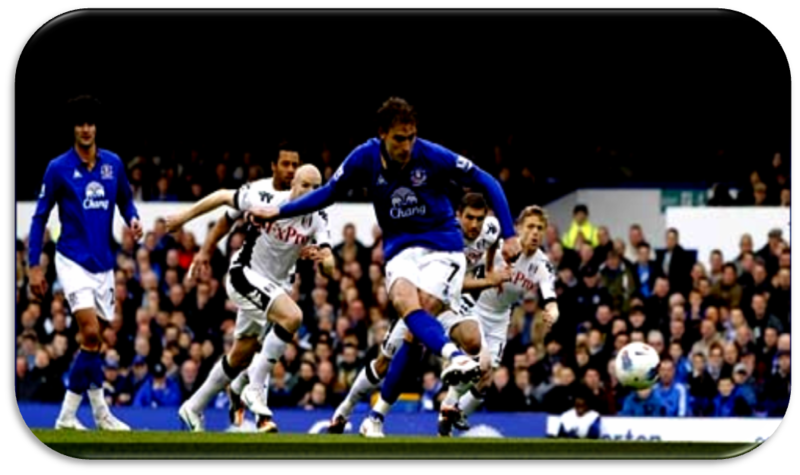 Congratulations to anyone who backed last weeks EB tip of Jelavic anytime /Everton win double vs Fulham at 5/2. The same bet is available for this fixture priced at 12/5 with Willie Hills, with Jelavic 11/2 with bet365 to be the game’s first scorer. We are best priced at 7/4 with Stan James to win the game. Our last 5 league games have involved 4 goals or more which is 16/5 with Willie Hills. Since being pushed into a more forward role Fellaini has scored in both games and you can get him to score anytime /Everton win double at 10/1 with the same vendor. Our hosts had most of the ball (62%) kept it better (86% v 76%) and made more passes (585 v 359) but pre match we had an idea this would be the case given Swan’s excellent style in keeping the ball. The key factor was whether we could disrupt their fluidity in playing through us. Swansea’s key man this season has arguably been Leon Britton whose 93% pass completion is the best retention rate in the top flight. He is key to Swansea’s rhythm and linking defence to midfield. 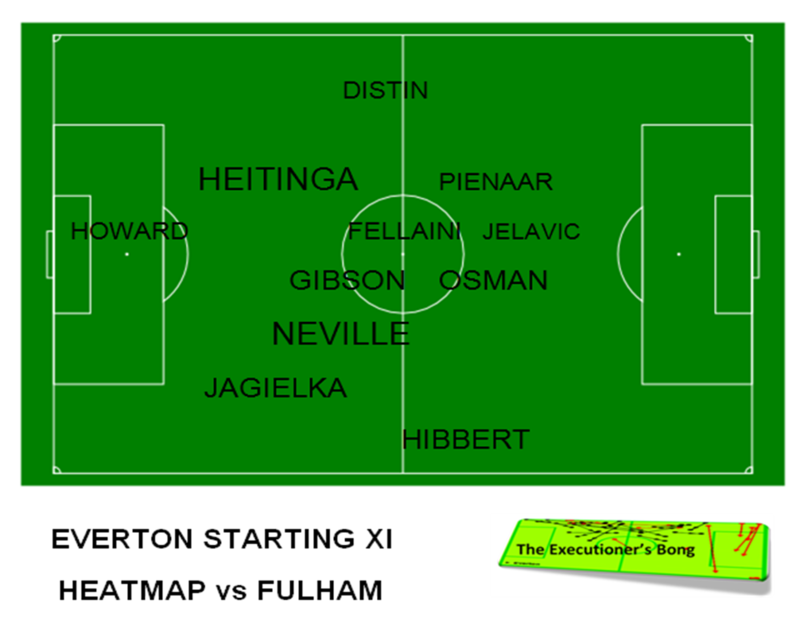 Our game plan from the off was to position ourselves to block off the angles from Vorm to the defenders with Osman and Pienaar positioning themselves high up the pitch. Cahill was asked to basically stand on Britton’s toes and ensure the midfielder had no space or angles to distribute forwards when the ball was played into him. This tactic really frustrated their key midfield man and one of the key themes of the first half was him constantly moving around the midfield zone looking for space, closely followed by Cahill. Unsurprisingly the duo covered the most – and almost exactly the same – distance in the first half from players on either side; Britton 2.78 miles and Cahill 2.76 miles respectively. The Bainaar axis was key to us getting a foothold in the game in the second period. The below graphic shows the players average positions and their font size demonstrates the volume of touches they had of the ball (the bigger the font the more touches). 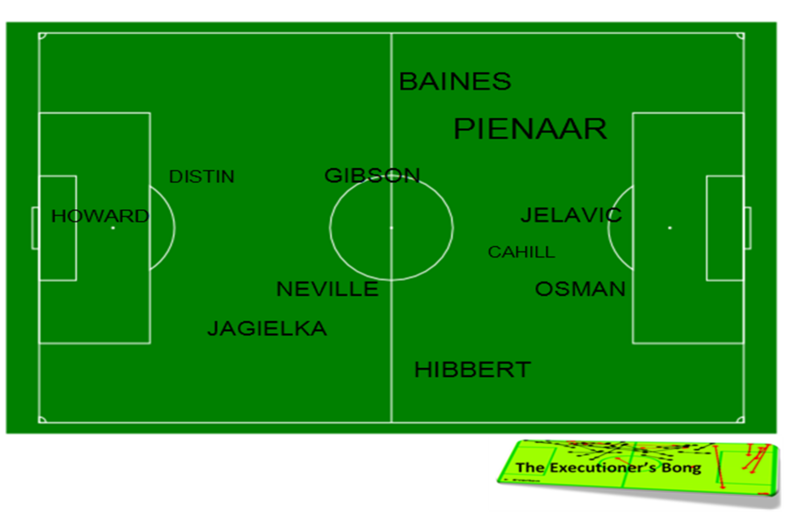 This shows the importance of Baines and Pienaar. The duo combined superbly down the left in the second period and one of their signature moves culminated in the Swan’s key defender Williams upending Pienaar. From the resulting freekick Baines curled home a superb effort into the top corner of Vorm’s net. 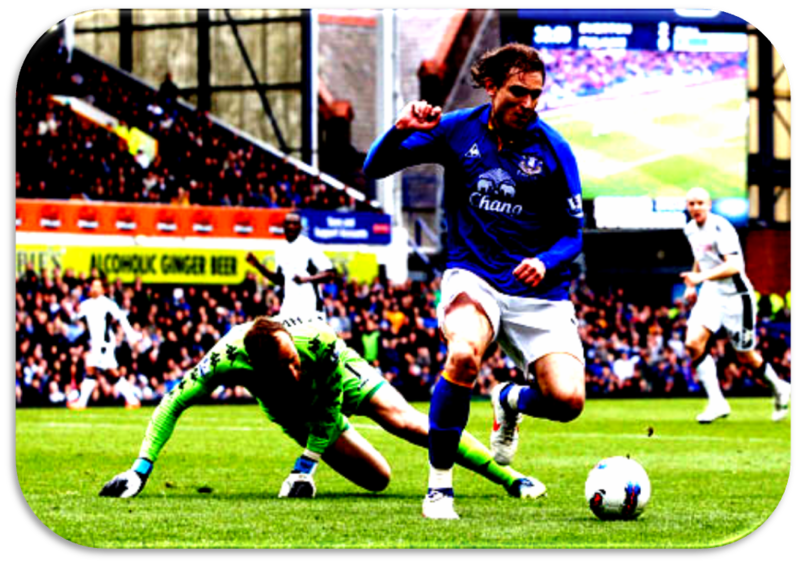 Pienaar and Osman were at their impish best on either flank; setting up 6 chances between them as the Blues missed a host of other chances before Jelavic – having just missed a sitter after another Pienaar run – was able to slot home after Fellaini’s physicality enabled him to turn away from Williams who was now being ragged all over the pitch. 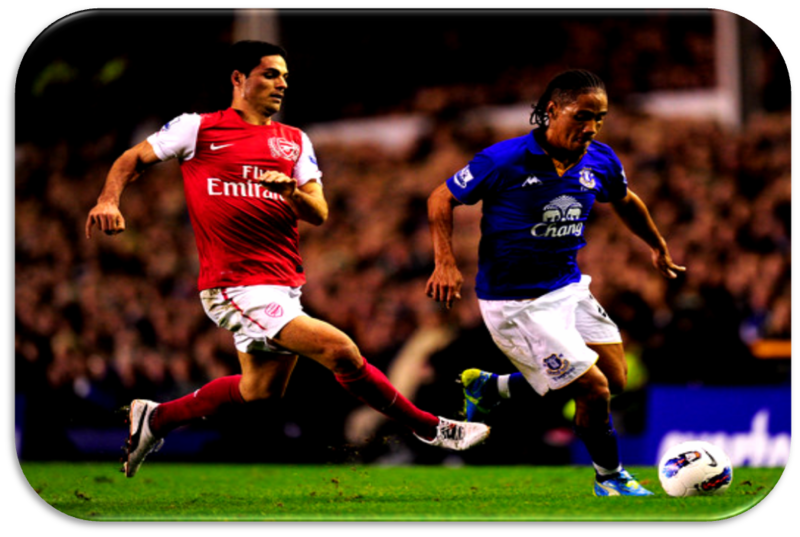 The Belgian had come on just before Baines opener and provided more of a threat than Cahill who lacked shattered after his tireless running in the first half. With the goals in the bag we looked to shut up shop, get men behind the ball and restrict Swansea from creating openings. Howard was incredibly well screened and only had one save to make in the 90mins as the Blues shape meant that Swansea couldn’t get behind our back line and were resorted to making speculative efforts from long range with 64% of their efforts pot shots and 0% from inside our 6 yard box. 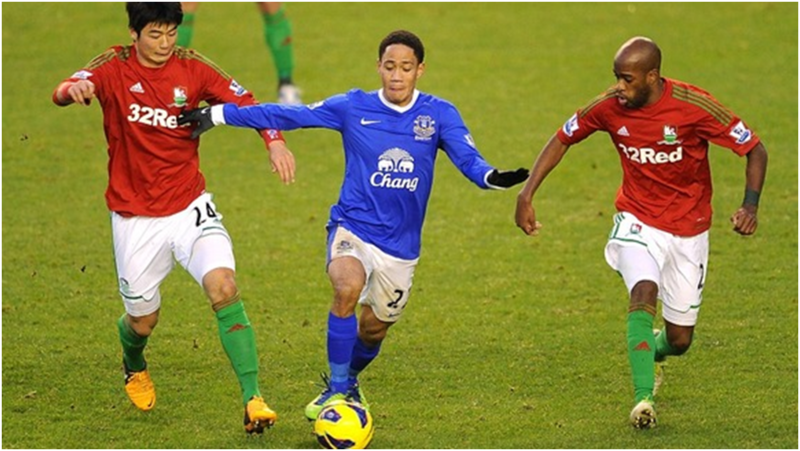 This image shows this (Swans left, Everton right) . 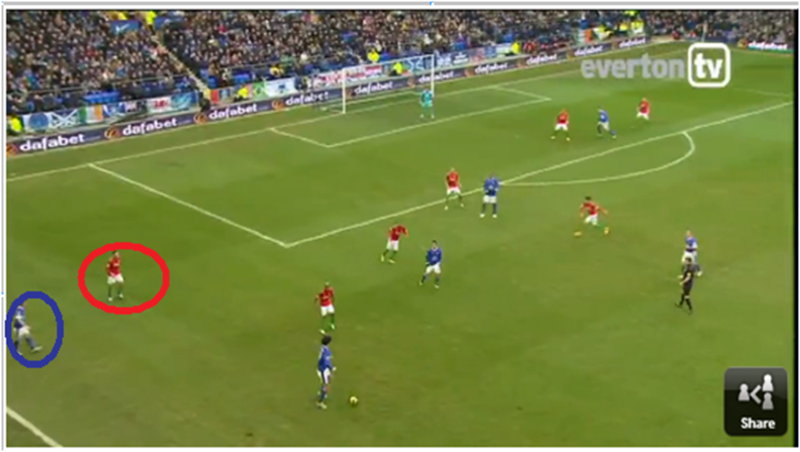 In total the Blues made a huge 20 interceptions from deploying this tactic of cutting off forward angles. 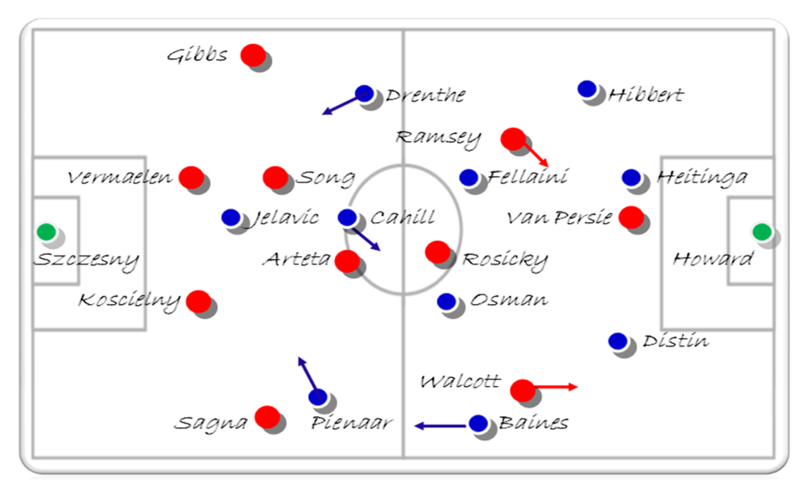 This great positional play and strong shape also enabled the Blues to conserve energy for the most part as Swansea’s possession was mostly confined to their own half and often broke down before reaching the final third. As the game drew to a close we continued to look threatening on the break and were unlucky not to add to our tally. 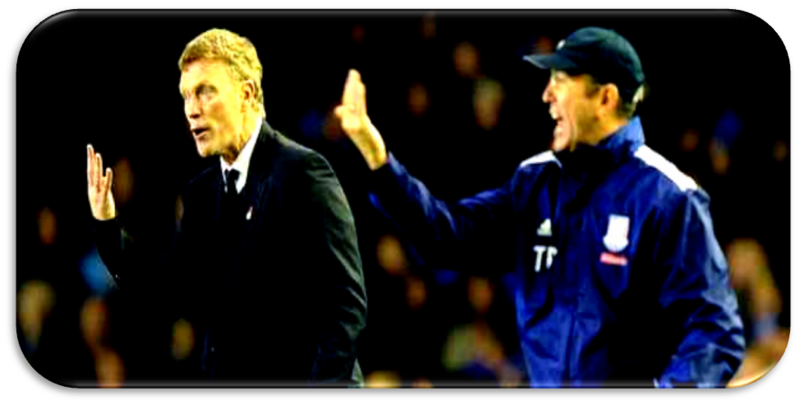 Stracquilarsi was snarling on the touchline and ready for action and on 82 minutes Moyes unlocked the key to his cage and as has become custom the belligerent Argentine galloped onto the pitch like a tiger who had been kept in a pen against his will and in need of some meat to satisfy his hunger. Straight away he was sharpening his claws on unsuspecting prey Williams and Caulker – making as many fouls in 8 mins as any of teammates had done in 90mins. He should have scored at least once – perhaps twice if I’m being tough – but 2-0 was the final score in what was a terrific display from the Blues. In the case of the last 45minutes it was arguably our best offensive display of the season against a side who have rarely been brushed aside with such ease….Bring on Sunderland! !